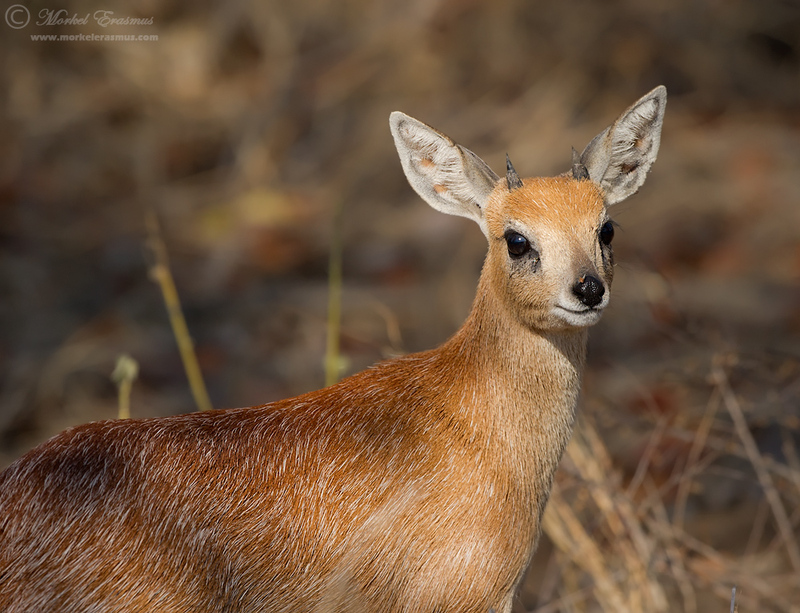 This is a cute little antelope found in Southern Africa called the Sharpe's Grysbok (Raphicerus sharpei). The name "Grysbok" translates directly from Afrikaans as "grey buck", and though they're not primarily grey of colour you can see the grey stubble coming through in its coat, as if it's sporting the beard of a middle-aged man. This is a very elusive, timid and shy little creature, and getting it to pose nicely for a photo is a rare treat indeed. They are solitary animals, but I have been fortunate to see a mating pair once, "doing their thing". This photo was captured close to Punda Maria rest camp in the Kruger National Park (South Africa). He was being a good model next to the road for me. I hope you all have a fabulous day. Thanks for viewing! A very good shot of a rare sighting!